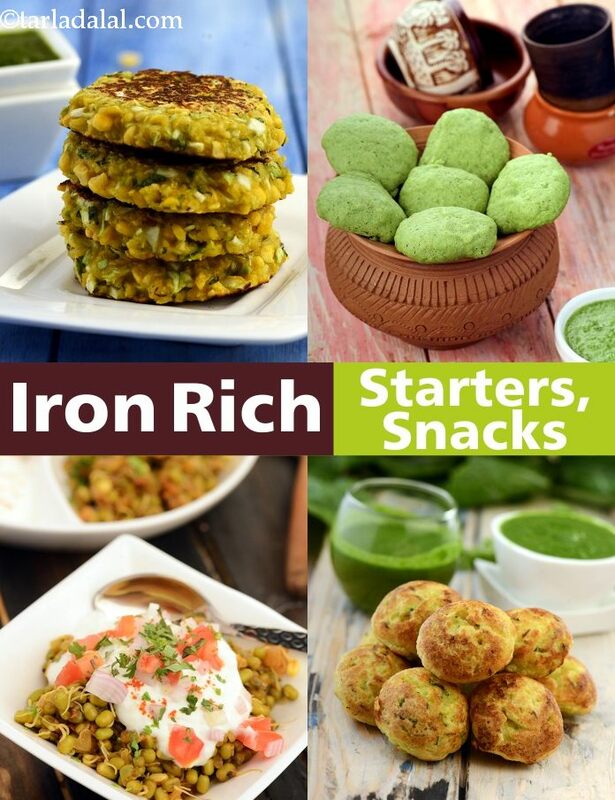 With a wide range of snacks and starters from muthias to kebabs and upma to chaat and dry snacks like khakhras and crispies, in this section all the recipes are made with iron boosting ingredients. However remember to not pair these snacks with a cup of tea or coffee. The tannins in these beverages bind with the iron, making it less of it available to your body. Imagine having snacks which are healthy and iron rich too. Chana Dal Cabbage Tikki is Diabetic and Heart firendly. We have an Oats based Tikki which is Pregnancy friendly also. Then you can have a chaat too from Healthy Moong Chaat. We all love South Indian food. Use Cauliflower Greens to make the super healthy Moong Dal Appe. We have converted the deep fried Masala Vadai and cooked them on a Tava. Ofcourse we want an Uttpa so we made it with Bajra for you. We hope you enjoy our fascinating recipe collection and would love to have your comments. Beaten rice (poha) is made in an iron pounder that contributes for its iron content. No wonder these yummy cutlets are packed with the richness of iron! Addition of lemon juice also helps in absorption of iron.